The marijuana legalization revolution is still going on and we are seeing achievements almost every single day. 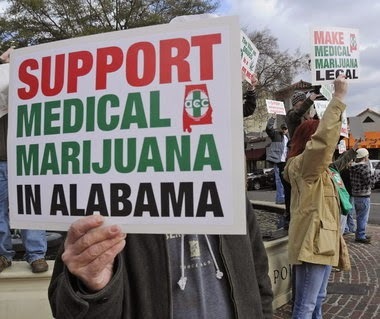 Now, the lawmakers in the State of Alabama, have decided to pass a new medical marijuana bill, which will definitely help to raise awareness about the benefits of this herb and allow other areas of the world, to legalize cannabis too. It was a unanimous decision at the Alabama legislature and this new bill, will now head out to Governor Robert Bentley, who has already talked about his support towards this cause and it is very likely that the bill will become a reality in the next couple of weeks. This new medical marijuana bill in Alabama, will allow people to buy prescribed medical grade cannabis, CBD or an extract that is non-intoxicating and even some cannabidoil. It was back in 1972, when Congress decided to ban cannabis oil, as they believed that it had no medical benefits, but today, there are plenty of scientific and medical studies, which prove that this oil and herb, have tons of medical benefits and that they are useful for treating conditions such as seizures and many more. At the moment, 20 States of the US, have now legalized medical marijuana and its oil extract, which is excellent news for all of us. This new medical marijuana bill in Alabama, is known as Carly's Law, as it was first developed in order to help young children, who were suffering from some tough seizures and some neurological disorders. It was Carly's parents, who first appealed to Mike Ball, who is Republican State Representative and who was also sponsoring the bill. They also contacted the governor, who was in complete favor of the bill and said that he would sign it, if he was given the chance. Jena Dalton, who is a resident of Madison, said "It's like a miracle. This does not happen in Alabama. We are the most conservative State." The new medical cannabis bill, will also come with a $1 million funding for neurology research of cannabidoil, at the University of Alabama-Birmingham, which is certainly great news too. David Standaert, who is part of the UAB's Department of Neurology stated, "UAB will undertake research into the mechanisms underlying cannabidoil to learn more about its function and effect on seizures." Please remember to share and like this blog post, so that more people can read about this new medical cannabis bill in Alabama and so they can support it too. If you want to stay informed about the latest marijuana news, feel free to subscribe to our newsletter, by leaving us your email in the box to the right. We will send you some interesting stuff related to marijuana and the legalization of this herb. Will Alaska Legalize Marijuana This Summer?